The school system’s newly appointed Ad Hoc Committee on Equity held its organizational meeting Thursday night, with members hoping to set a new national standard for ensuring all segments of the school population have access to the opportunities the district offers. The 25-member panel includes three School Board members, educators, parents and representatives of community groups ranging from the PTA to the NAACP. During its first meeting, the panel broke into groups to talk about their concerns and goals for the committee’s work. The discussions were intended to help set the foundation of the program. Next week, they will be joined by a facilitator who has been hired to help guide their work. School Board Vice Chairwoman Brenda Sheridan (Sterling) is leading the group. “Why was this committee created? It was because it was demanded by the public,” she said, noting the overwhelming outpouring of concerns raised by parent and community leaders during recent School Board meetings. 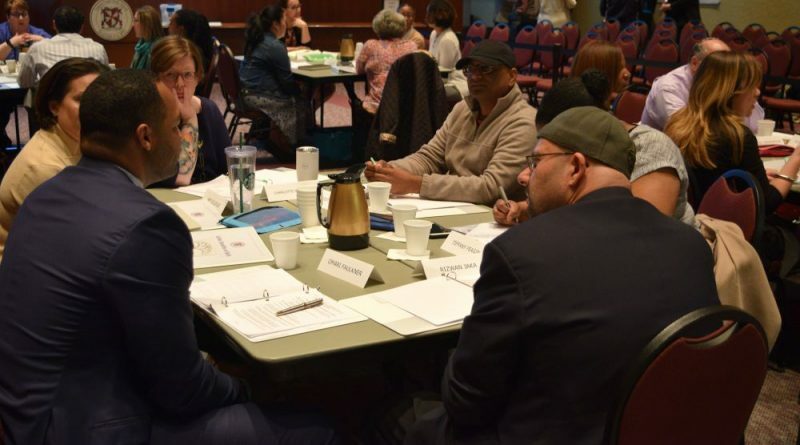 During the sessions, members discussed the need to increase parental involvement, improve teacher training, recruit more minority educators—and to tackle many uncomfortable and challenging issues involving racism and biases. Future meetings will be facilitated by Jamie Almanzan, of the Equity Collaborative in Oakland, CA. In a video introduction to the panel, Almanzan said he had taught at every level of public school and got into teaching to be an example for minority students. “I wanted to be the Mexican teacher I never had,” he said. Another consultant group is conducting an equity audit throughout the school system, with plans for 24 on-site school visits and a series of focus groups and interviews, with the goal of providing the committee its findings by June. The committee plans weekly meetings on Thursdays at the School Board Administration Building in Broadlands. The next meeting is April 11, starting at 5:30 p.m.
1 Stop allowing experienced teachers to transfer west each year thereby insuring every school has similar experience. It can’t be fair to your goal to have eastern Loudoun having substantially lower experience levels. The last study i saw as a school board member had literally decades of difference between eastern versus central Loudoun schools. 2 Demand some core courses be offered at Monroe Tech so students can take advantage of this program to a greater extent and supply high schools with the technology to expand these offerings to all high schools. 3 Allow all high schools to offer the first two years of the AOS program as it already is a numbered course. in this way far more students can benefit from this excellent inquiry based course including diverse students who this far have been apparently excluded. 4 Stop expelling students who are not violent/dangerous. Stop the practice of “setting an example” discipline which seems to profile diverse students unfairly and disproportionately. Douglas School was designed for such behavioral challenges. 5 Stop busing the poorest diverse segment of the Loudoun population (Plaza Street area) to four different schools and let them walk to a much improved, smaller class sized F. Douglas Elementary School. 6 Parental input is critical to gauge teacher performance. Without it why should parents (especially recent immigrants) even feel they have any input into the treatment of their child. 7 Homework is supposed to reinforce material covered in class yet for diverse students whose parents may not even speak English the degree of emphasis on students doing work at home is incredibly discriminatory, unfair and abusive for a school system that prides itself on producing a climate of success. Ask parents how much their children are missing out on as they spend there entire evenings doing what SHOULD HAVE BEEN COVERED IN THE CLASSROOM! I feel inequitable outcomes could be investigated and addressed within the school system. Both consultants make a living in finding racism. Have they ever not found it? Have factors other than racism been identified? I can think of a lot of other reasons why students don’t perform well. They have been debated successfully for decades. Bias may be assumed by hiring Equity Collaborative, because the equity audit may not be finished. When will we know when equity is be achieved? That answer is important. Will students believe the reasons they fail to achieve equitable goals is due to racism? Perhaps in some cases they may need to blame themselves. Couldn’t agree more. Their website states “The core tenets of our work are oppression analysis, …”. If they assume groups are “oppressed” in Loudoun, then how do some “oppressed” minority groups (Indians and Asians) make up 44% of the Academies population with only 22% of the student population? This is about merit. That being said, having role models for all students is important. We have certain groups (blacks) hired at a lower rate compared to other groups (whites). It is unreasonable to bring the % of growing teachers from growing populations (Hispanic) up to their student population % quickly as teachers teach for decades in the system (the % of teachers from each group changes more slowly). But when we have 6x the number of applicants as job openings, it doesn’t make sense that we only hire 12% of black applicants while hiring 16% of other groups. There should at least be some central oversight of who is being hired. Of course, if LCPS were competent, they would also remove ineffective teachers after a few years. But since the school board consists mainly of LCPS employee spouses, that ain’t going to happen any time soon. Unless the voters get wise this fall. LN would do a service by reporting how much these “consultants” are costing tax payers. Why was that left out?